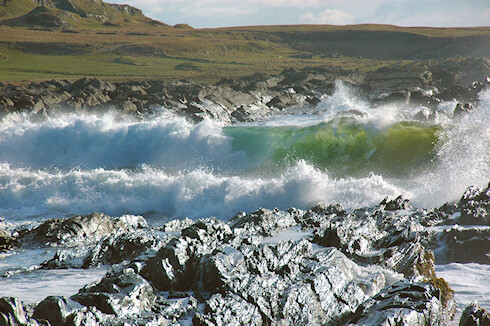 Taken in April 2009, waves breaking at the southern end of Saligo Bay on the west coast of Islay. It was a quite high tide that day and the waves were breaking beautifully as they were approaching the shore, especially towards the southern end of the bay. As usual I'll post the larger version (larger as in more than twice as big) tomorrow morning (Saturday morning) on the Islay Pictures photoblog. Brings out the wave better than the limited space I have available here.